Home Aerospace Aerospace Who has airpower superiority in southern Africa? Who has airpower superiority in southern Africa? South Africa’s reputation as top gun when it comes to air power in the southern African region could be shot down by Angola and its powerful new Russian fighters. The west African country is set to take delivery of the first tranche of Sukhoi Su-30K fighters in the next six months and will have 12 in service by the end of next year. 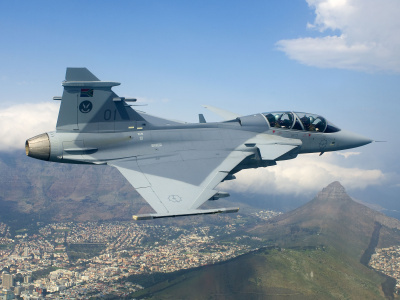 Gauteng Afrikaans daily Beeld approached military analyst Helmoed Heitman, retired SAAF and Indian Air Force pilot colonel Rama Iyer and a former officer commanding 2 Squadron for their views on how the SA Air Force’s (SAAF) Gripens would shape up against the Russian fighter. A brief assessment points out the Gripen is faster but has less firepower while the Su-30K is more powerful and can carry more weapons. The Sukhoi also has better weapons systems while South Africa’s Gripens are hamstrung in this department by budgetary constraints (at present they are only fitted with visual range IRIS-T air-to-air missiles for aerial combat). When it comes to pilots, South Africa’s are better qualified than their Angolan counterparts. Heitman said the Sukhoi has longer legs than the Gripen and this, added to the planned Angolan over the horizon missile buy, makes it a more effective platform than the Gripen. His blunt assessment is to keep the Gripens on the ground. Iyer doesn’t see the Sukhois making any immediate change to the air power situation in the region, pointing out how Angola utilises the new additions to its air force must be taken into account. That the Gripens have less power than the Sukhois is an advantage in air combat because it makes the Swedish fighter more manoeuvrable, he said, adding air combat was no longer just dogfighting. A former 2 Squadron commander, Cobus Toerien, told the paper the Sukhoi was phenomenal in terms of strike power. “If Angola was serious about striking at key installations in South Africa the Su-30 can, as one example, come into local airspace and shoot our power stations to smithereens. AFB Makhado at Louis Trichardt with the runways and aircraft on the ground can also be a target and then our Gripens are worth nothing”. The fighters Angola is acquiring were previously in service with the Indian Air Force. They are being upgraded in Belarus prior to delivery. Two years ago, Lieutenant Colonel Musa ‘Midnite’ Mbhokota, Officer Commanding 2 Squadron at AFB Makhado, said that if the Southern African Development Community (SADC) as a region and South Africa as a country wish to be taken seriously on the continent, a Beyond Visual Range (BVR) capability must be introduced for the SA Air Force’s Gripen C/D fighters. Otherwise the Air Force has no chance to achieve air superiority in a given theatre. Presenting a paper at the South African Joint Air Defence Symposium (SAJADS), Mbhokota said that although no African country was in any way threatening the SADC region, African air forces exist with BVR capabilities and as long as the SAAF does not have this, it would not stand a chance in a hypothetical conflict with such forces. African air forces equipped with BVR missiles included Uganda, equipped with 12 Sukhoi Su-30 Flanker H multi-role long range fighters. These are equipped with the Russian answer to the US AMRAAM BVR missile, the AA-12 Adder (Russian R-77). The Su-30 is a very large aircraft and could carry up to 12 BVR missiles, while the Gripen, even with BVR, could carry only four. An earlier example of African BRV use was during the Ethiopian-Eritrean War (1998-2000) where Ethiopia obtained Sukhoi Su-27 Flankers and Eritrea received Mikoyan-Gurevich MiG-29s, both with BVR capability. In addition, Morocco flies the F-16 equipped with AMRAAMs while Egypt has the latest Block 52 F-16 with the more modern AIM-120C AMRAAM. Another problem, which Mbhokota described as a “step back”, was the ending of air-to-air refuelling in 2005. He said the SAAF’s Gripens had flown to the Central African Republic (CAR) in2013 with a refuelling stop in Ndola, Zambia. But, “before 2005, we would have gone to CAR directly and come back”. Mbhokota said the answer was to obtain an “Off The Shelf” BVR missile while an indigenous version was developed in South Africa. The Gripen’s IRIS-T air-to-air missiles will be replaced by the locally developed A-Darter short range weapon, which has already been integrated onto the Gripen. This still will not give the Gripen a BVR capability, but Denel Dynamics is currently developing the Marlin family of radar-guided missiles, which, if ordered by the SAAF, would finally give it a BVR capability not had since the V4 R-Darter was retired in 2008. Denel Dynamics plans to fly a Marlin prototype in the coming years.